The countdown is coming to an end. The engines ignite; the rocket is engulfed by a cloud of fire and smoke, lift off, and in an instant it’s gone… billowing towards the heavens. Launch activity is an essential component of the spaceflight industry. It is impossible to benefit from space science and technology without putting satellites in orbit. But what are those billowing clouds actually made of? And what effect does a rocket launch have on the surrounding environment? 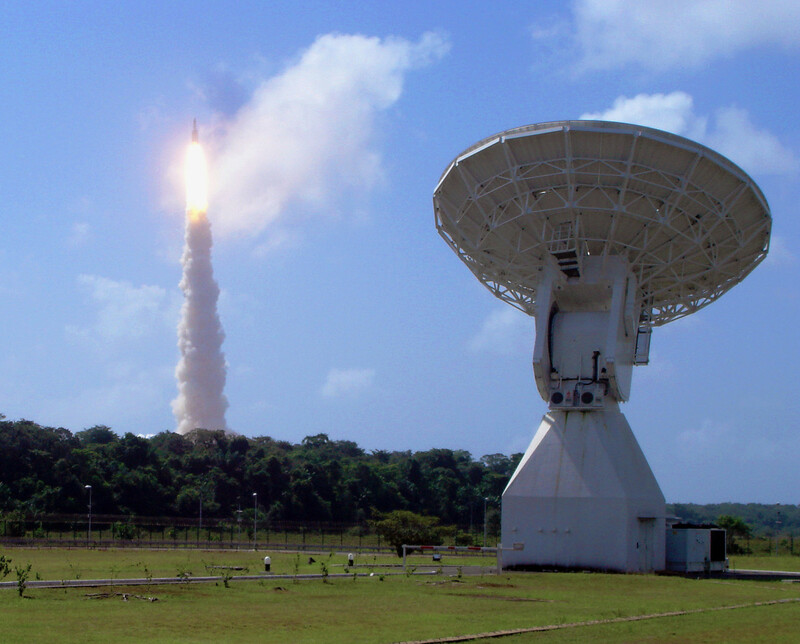 Perhaps the launch site most prone to such questions is the Guiana Space Centre (CSG), a French and European spaceport located in Kourou, in close proximity to the rain forest of French Guiana, host to some of the most diverse flora and fauna on Earth. Operational since 1968, CSG operates three different launch vehicles – the European Ariane V and Vega, and the Russian Soyuz, launched under the terms of a Russo-European joint venture. Ariane 5 V188 with Herschel and Planck on board rises above ESA’s 15 m-diameter Estrack tracking dish at Kourou, French Guiana, just after lift off (Credits: ESA/A. Chance). Ariane V is a heavy launcher capable of putting six ton satellites into geostationary orbit and 21 ton payloads in low Earth orbit. Vega is a small launcher used to launch 1.5 ton satellites into a 700km low Earth orbit. Both use a solid propellant that releases aluminum oxide (Al2O3) into the air, a molecule that can, in high concentrations, damage plant life. The kerosene-powered Soyuz is able to put satellites between 2.7 and 4.9 tons in low Earth and geostationary orbits. This kind of propulsion generates emissions mostly composed of water (H2O), carbon dioxide (CO2), carbon monoxide (CO), as well as other combustion residues. These residues contribute to acidification of plants and soils. However, there are only three Soyuz launches per year at CSG and these residues are also generated by other sources such as cars, planes, and boats. As a result, it is very difficult to monitor pollution specifically due to Soyuz launches. French space agency CNES created an environmental measurement plan after the infamous first Ariane V launch of 1996. The launch ended in disaster when the launcher exploded 36.7 seconds after lift-off. Nobody was injured, but the explosion highlighted the possible impact of launches on the local environment. CNES is not the only space agency to worry about its rockets polluting the environment. NASA, for instance, assesses the environmental impact of each program before it is authorized and has tested rocket wakes to determine their effect on the atmosphere. 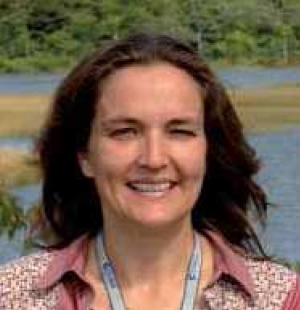 However, notes Sandrine Richard, an environmentalist working at CSG since 2005, it is difficult to reach a general understanding of launch impacts that translates across sites. “We could compare quantities of exhaust products using the number of launches, for example,” she says. “But the launchers are not comparable.” When comparing sites like Kourou and NASA’s Cape Canaveral, the host environments are also dramatically different – but not as different as a site like Baikonour. It turns out environmental impact must be assessed on a case-by-case basis. 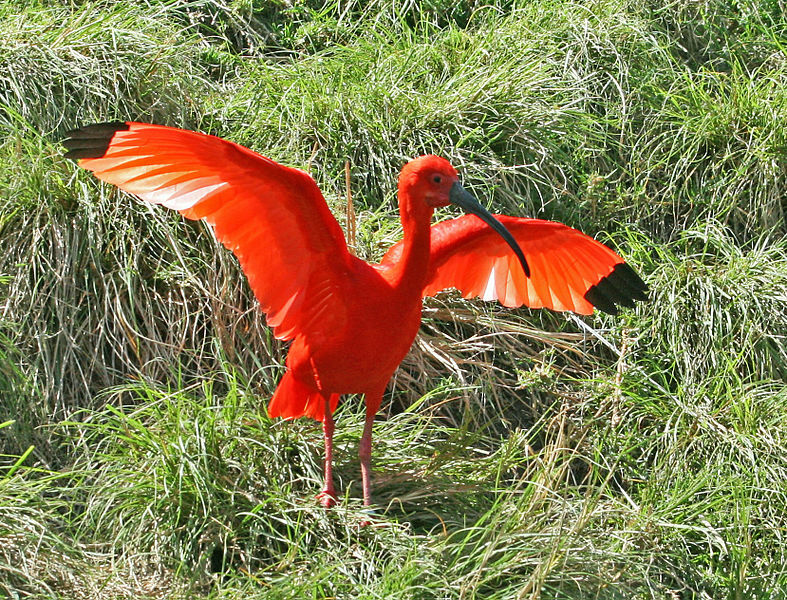 The bird Scarlet Ibis is one species that is regularly monitored at the site. This species lives on the littoral coast – the area from shoreline to high-water mark – occupied by CSG. The Ibis’s eggshell thickness is very sensitive to the bird’s food supply. If the Ibis ingests pollutants, it will produce more fragile eggs, jeopardizing the new generation of birds. Without interfering with the animals, scientists can measure the long term effects of launches on the birds. Scarlet Ibis (Eudocimus ruber) (Credits: sandy Cole). All of which is not to say there nothing to worry about when it comes to protecting the environment around spaceports. It turns out that the ongoing human presence required to support periodic launches is more damaging than the launches themselves. At CSG, “70% of power supply at CSG is used for air conditioning,” says Richard. As a result, part of her efforts are focused on sustainable development and renovating buildings to implement energy saving measures such as enhanced use of solar light and creating airtight windows. Wherever impacts from launch activities can be reduced, they are. For instance, CSG is working on an improved gas production treatment technique at the payload S5 assembly. “The use of a washing column will considerably improve the treatment,” Richard notes, reducing the release of impurities. Such progress is immediately shared with others in the scientific community to spread successful methods across the globe. Rocket technologies are much more similar than the environments from which they launch. Rockets do not change when we move them from site to site. As Richard puts it, “we launch Soyuz in Baikonur as we launch it in Guiana.” But the infrastructure around those launches can differ dramatically to adapt to temperature, humidity, overall climate, and local flora and fauna. “There are impacts on buildings for preparing, storing and assembling for some operations which must be realized in a controlled environment,” explains Richard. This is where environment and spacecraft most come into conflict. 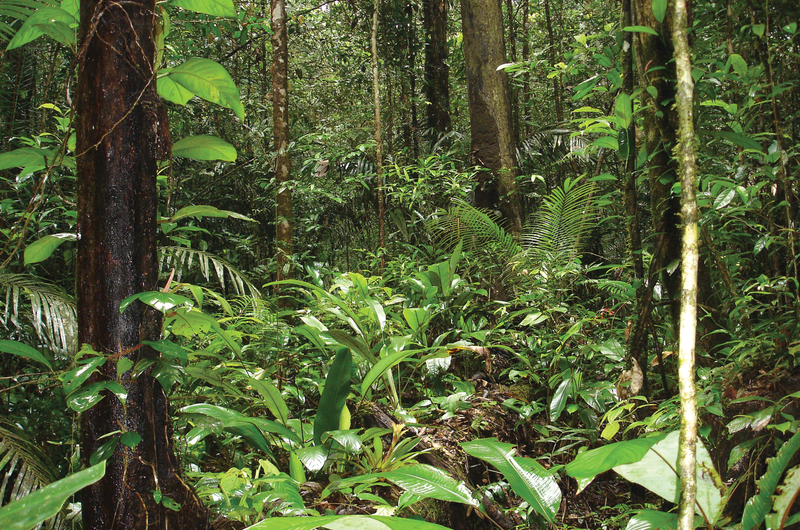 The forests of French Guiana (Credits: Wilkinson M, Sherratt E, Starace F, Gower DJ (2013)). In addition to minimizing impact on the environment, CSG is finding ways to promote biodiversity in the region. Partnering with the National Forest Office (ONF), CSG organizes tourist visits of the surrounding area. Once a month, conducted by a guide from ONF, the public is able to learn about rare plants and animals living on the CSG grounds. It is a strange juxtaposition, some of Earth’s most pristine ecosystems side-by-size with humanity’s greatest technological construct. If Sandrine Richard’s mission is successful, it is a juxtaposition that will thrive for many years to come.